In this last part of the series - following Part I on database analysis programs and Part II on chessplaying software - I'd like to look at some of the database resources available and discuss their importance for the improving player. In addition to standard database files, typically containing very large collections of games in a proprietary or PGN format, there are now online, browser-accessible database references and a large number of e-books which are in reality database files with associated text and annotations. We'll look at some examples from each category. The first indispensable database for any player is one that contains your own games. Unless you've been keeping separate online records of your games - something many chessplaying sites will now do automatically for you - you will need to manually enter them on your database program board. This in itself can be a learning experience, so even if you have a stack of old tournament scoresheets lying around, that can be viewed as an opportunity rather than a chore. 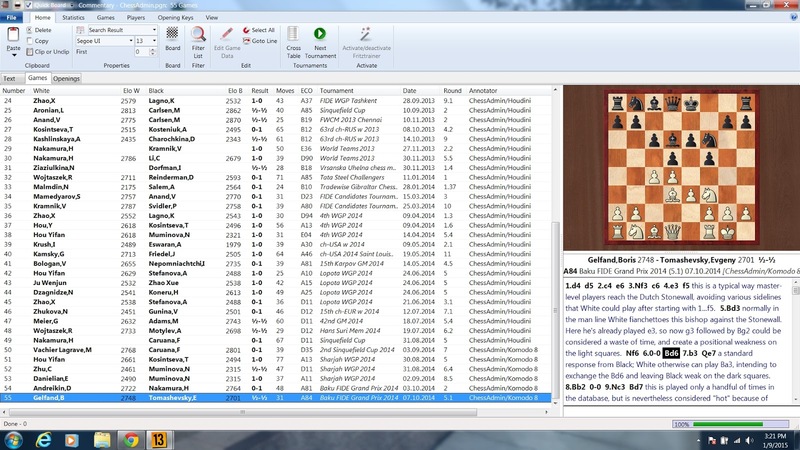 I keep separate databases for my over-the-board (OTB) tournament games and slow online games completed at Chess.com (mostly from the Slow Chess League), since I prefer to split the different types of games. As needed, though, I could easily combine them into a single database by copying and pasting the games into a new one. The importance of having a personal games database is hard to underestimate, although I think many amateurs often do just that. For the improving chessplayer, at minimum all of your tournament games should be recorded and analyzed to determine what you did right, as well as where you went wrong, and what general and specific lessons you can take away from each game. Aside from games decided by rare one-move blunders in the opening - which may also be worth remembering for the future - each game then becomes an opportunity for in-depth chess study and research. See "Analyzing your own games is more than analyzing your own games" for more on this approach to training. Personal databases allow you to generate statistics on your performance at the push of a button. Even basic stats such as your won-loss record with each color, score and performance rating by opening, and score against different rating categories can lead to new insights and identify unexpected weaknesses (or strengths). Your personal database should be one of the centers of your preparation for future tournaments/games, especially if you have regularly recurring opponents, opening lines, or middlegame and endgame themes. Understanding and identifying commonalities in past games, including solutions that you reached in subsequent analysis, should guide your expectations for future play. This helps ensure that the lessons you learn one day are not simply forgotten the next. Next we have what most people automatically think about when they see the word "database", the very large comprehensive databases with millions of games. These types of reference databases are fundamental for analysis, research and comparison purposes. Along with quantity of games, however, quality of games is just as important, and having annotated games included is a major benefit. For ChessBase users, the yearly "Mega" database is the gold standard, primarily because it includes a significant number of games annotated by world-class players. You can easily search on just annotated games, for example, to get the most out of this feature. The ChessBase "Big" database version is similarly large, but lacks the annotated games. The other main commercial option, Chess Assistant, comes with a database with a similarly high number of games (over 6 million). Free large-scale databases for download can be found via internet search. I can't vouch for their quality, but one good place to start for resources is Chessopolis. To a large extent the freeware function for reference databases has been taken over by browser-accessible databases (see next section). Updating your main reference database can be done either commercially - both of the commercial packages mentioned above typically come with one year of free downloaded updates - or via The Week in Chess (TWIC), an outstanding freely available service to the international chess community. TWIC has other news and features that are of interest. The last category of databases I want to discuss is specific to a purpose and typically is created by a player interested in a particular topic, using a search on a reference database. Some other prepackaged databases also fall into this category, including ones specializing in a particular opening, for example. One of the most obvious "purpose" databases to create is one containing the games of a known future opponent. Even for amateurs this can be easily done in online communities, where individuals' games are accessible and often downloadable in PGN. I do this at Chess.com when preparing for Slow Chess League games, to see what openings my opponents use and to see something of their style of play. Professionals of course do this on a much more intensive level. One opening study method is to look at the games of a model player, someone who frequently played the opening with success on a professional level. A database search, typically by ECO code, can easily create such a roster of games for review and analysis, as I did with the "Stonewall Hero" exercise. IM Jeremy Silman also discusses the use of databases for opening preparation in a recent Chess.com article. Specific databases for study purposes can be created based on almost anything that you can think of, including specific middlegame and endgame structures, subject to the limitations of the search functions in your database analysis software. This blog includes PGN database collections of my published annotated commentary games (master-level) and personal games; download links are in the sidebar. Blunder Prone has some recent comments on deliberate practice using databases. Browser-accessible, large online databases have proliferated and evolved to the point where they have become a genuine alternative to prepackaged, local database files. Often they will allow you to download your search results in PGN format, which allows you to then annotate and manipulate the databases for study. Because of the large number of database resources now available, I won't try to provide a comprehensive list, but rather a few selected places to start. Chess Tempo is a site whose primary function is to serve as a training resource, with both basic (free) and commercial features. For example, it has tactics training, endgame training, and a range of options for computer opponents (the topic of Part II). However, it also has an online, updated databases of 2+ million games with advanced search and filter options. Laurent S mentioned this in his comment on a previous post on computer resources. 365Chess.com is another site featuring a large (3.5+ million) searchable database that also has some training functions. It is set up similarly with basic (free) and advanced (commercial) features, with PGN downloads and database creation among the latter. On a simpler level, the Shredder site has opening and endgame online databases that also allow you to paste in a position (in FEN) for searching. While Chess.com is not primarily a database site, its "Game Explorer" feature allows for basic database exploration and PGN download of games. It's worth noting that the main commercial database products also now have "live" components, with ChessBase's LiveBase accessible to its customers. The more sophisticated e-book products are, in essence, "purpose" databases where the main selling points are the narratives/text and annotations included with the games, rather than the games database per se. This is not to say that simpler e-books, which are essentially digital copies of print editions, aren't useful; they significantly enhance both the portability and availability of chess products. However, e-books that contain databases have a significantly greater potential for your own investigation and analysis, as you can more easily explore related ideas via included links and your own searches. They also don't require you to have a physical chess set with you. Everyman Chess is a leading e-book publisher and their extensive free sample downloads are an excellent way to "try before you buy". ChessBase has a similarly wide variety of "Fritztrainer" training products that include video narration along with annotated databases. The DVDs can be used either with a commercial ChessBase product or with a free viewer. One of the first I purchased was Viktor Kortchnoi's autobiographical "My Life for Chess" which was both entertaining and useful. While opening study is an obviously useful subject for e-books, they are also taking advantage of the format's applicability to everything from game collections of top players to classic training works like Capablanca's Chess Fundamentals. While I've included references to a number of training resources and methods in this post and in the earlier parts of this series, I haven't looked at computer resources whose specific function is training. I will, however, include some discussion of them in an upcoming post - "Chess Improvement Programs: Directed vs. Eclectic". Their app is the best of all that I've tried, hands down. Not only can you automatically play over the moves and load an engine for analysis, it lets you make your own moves if you're curious about a particular line that isn't discussed. Not as huge of a library as Everyman, but they publish from several smaller companies. Quality Chess, New In Chess and Chess Stars generally have the best material. Gambit also publishes their own interactive chess app, but the library is very small. The prices are reasonable though. I'd rate this app 2nd after Forward Chess. Everyman's app is just wretched in every way. It's like their goal was to set out and find an interface that punished people for using it. Their library is HUGE though. Unfortunately, many of the books are overpriced and it seems like it's 90% opening books. But if you're in the market for a particular book from Everyman, there's a better than decent chance they have it available. Which brings me to the last app... Chess PGN Master. It's a great app. Almost as good as Forward Chess, but no ability to play your own moves. It's main selling point for me was that I can use it for the Everyman book I've bought. There's a free version, but I spent the $5 for the paid version about 10 minutes after using it. You can't buy ebooks, it's just an interactive chess app. But it's a darn good one and worth the little bit of money to make the Everyman library usable. Excellent recommendations, thanks for posting them! Independent apps / GUIs for e-books are definitely of varying quality, so the Chess PGN Master recommendation I think is especially helpful. Most of the Everyman e-books are also in ChessBase format, so if that is already installed on your system, there's no need to get an additional program and the GUI will be the same. Thanks for you replies. Another great post. From my perspective, the Chessbase database is significantly better than the Chess Assistant one. It seems there are a good number of historical games both very early but also later sometimes from big tourneys that the Chess Assistant Database doesn't have. One of the main reasons I sometimes prefer to use Chessbase. Of course it still has many, many games and so is still useful for a lot of work.